Today on the Doc On the Run Podcast we’re talking about discipline and what it takes to recover from running injuries. At the end of this episode you can download your free worksheet on the Top 10 Questions a Runner Should Ask When Going to the Doctor. Many years ago, after I had been going Ironman races for couple of years I decided that I wanted to do Ironman Hawaii. Of course you have to qualify for that race. Qualifying for the Ironman World Championships is very difficult. But I sought out every available resource. I read everything I could find in triathlon magazines. I bought several books on Ironman training. I learned more about the physiology of training in an effort you understand what it would take to qualify for Ironman Hawaii. I have an uncle who actually did Ironman Hawaii several times in the 1980s when it was really and truly an adventure. At that time there were no carbon fiber bicycles, no aero wheels and very little information on how to train for races of that distance. With no power meter, no coach and without all of the modern day secret formulas, my uncle Jay had qualified for Ironman Hawaii twice. Jay actually lives in Dana Point near San Diego. He lives in the Mecca of triathlon training. He not only knew but had trained with some of the legends of Ironman. For a little background I will also say that Jay is a really interesting guy. He was a Colonel in the U.S. Army and one point was the Attaché to Burma. He has lived all over the world and he’s been very successful in virtually everything he has ever done. During this period when I had made the initial decision to qualify for Ironman Hawaii, a medical conference, the American College of Foot & Ankle Surgeons annual scientific conference was being held in Long Beach, California. This is fairly close to where Jay lives and works. So I called Jay and asked if we could meet. Truth be told I was hoping Jay would share his secret formula with me. I explained to him how I had been training and getting faster. I was getting stronger. I was consistent in my training. I was considering using a power meter to further refine my bike training. I talked about lactate threshold testing. I discussed my numbers and what I thought they meant. I talked about changes in my running form, my bike position, and I talked about the application of periodization in my training schedule. And I asked Jay what he thought. I have to say that I was actually somewhat deflated and disappointed to hear that. But he was right. The problem with discipline is that most runners often seem to perceive discipline and hard work are synonymous. After all, it does take lots of discipline and hard work to become a strong runner. We learn to suffer. Through discipline we learn to put on our running shoes and run in the dark. We run in the rain. We run through aches and pains because we have, through years of training, developed discipline. But sometimes it is exactly that sort of thinking which actually limits our progress. It is true that training in itself is deliberate tissue damage. We go out and train hard, strain our muscles, we stress our tendons ligaments and bones and in response they become stronger. So in many ways an over training injury is just an exaggerated consequence of what might occur in the normal course of training. But that true over-training injury is more than our bodies can handle while sustaining the same effort. Recovering from an over training injury in some ways differs from the standard training process. The tissue damage that is sustained in normal training heals itself while you sleep. Within a day or two you are as good as new. Recovery from that level of tissue damage only requires good nutrition and a little bit asleep. It doesn’t take any discipline. It takes discipline to recover from an over training injury. It takes discipline to shift your mindset. You have to change focus, you have to focus on what you want most. Before you can focus on what you want most you have to determine and decide upon your most important goal. What is your most important running goal right now? Maybe your goal is to run 20 miles per week. Maybe your goal is to run 3 miles 3 to 5 times per week. Maybe your goal is to finish the Chicago Marathon. Maybe your goal is to qualify for the Boston Marathon. Maybe your goal is to finish your first 5K. Maybe your goal is even more specific. Maybe your goal is to run the Houston Half Marathon on January 14 in 1 hour and 29 minutes and 59 seconds. Most runners listening to this podcast have some very specific goal. What I find astonishing is that in the overwhelming majority of cases they tell me something like they want their stress fracture to heal. They tell me they want their Achilles tendon pain to go away. They want their foot to stop hurting. But if that were true it makes no sense at all that this patient is talking to me. 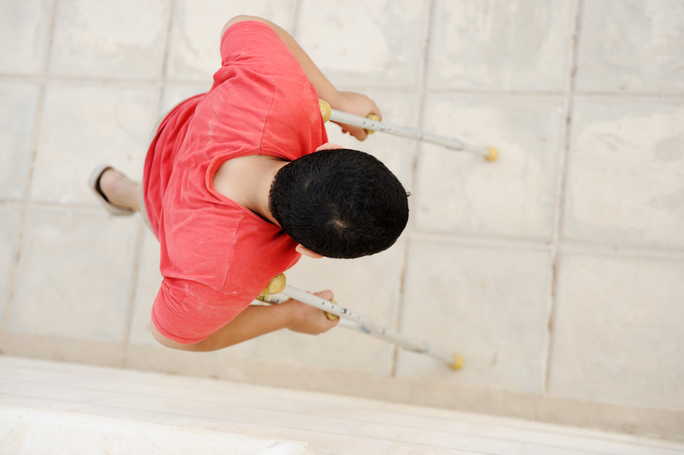 Most patients have insurance and for the cost of a co-pay they can go see their local podiatrist, a sports medicine doctor, an orthopedist or even an emergency room physician. Any doctor can help a patient with foot pain figure out how to heal the specific injury and make the foot stop hurting. But instead they decided to pay me, sometimes hundreds of dollars to help cure their foot pain. So it makes no sense when tell me they want somebody to fix her foot pain. But truthfully they have found me because they need something different. They decided to call me because I do something different. Every injured runner seeks treatment because she wants to run without pain. Foot pain is interfering with the goal. The foot pain appears to be a significant obstacle between where the runner is right now and where the runner wants to be. My job is to help the runner figure out how to remove that obstacle. Pain is not the problem. The pain is just an obstacle. You have to communicate your most important goal to your doctor. Communicating with your doctor also requires discipline. Doctors are trained to fix problems. Most doctors in United States are also severely overscheduled and often deliberately over-booked. They create protocols and standard treatment regimens to help speed up the flow of patients through their clinics. They use medical assistants, physician assistants, nurses even glorified high school graduates called “med techs” who explain conditions to patients instead of doing it themselves. Like it or not, if you’re an injured runner and you have a complicated condition with an upcoming race and you’re trying to figure out how to do the race, you have to first figure out how you can keep the doctor in the treatment room long enough to listen to your story and understand your problem. Have you ever noticed a doctor reaching for the doorknob in the treatment room while you’re asking a question? I have. The doctor in that moment is very clearly communicating to you through body language that your time is up. It’s time for the doctor to move on. 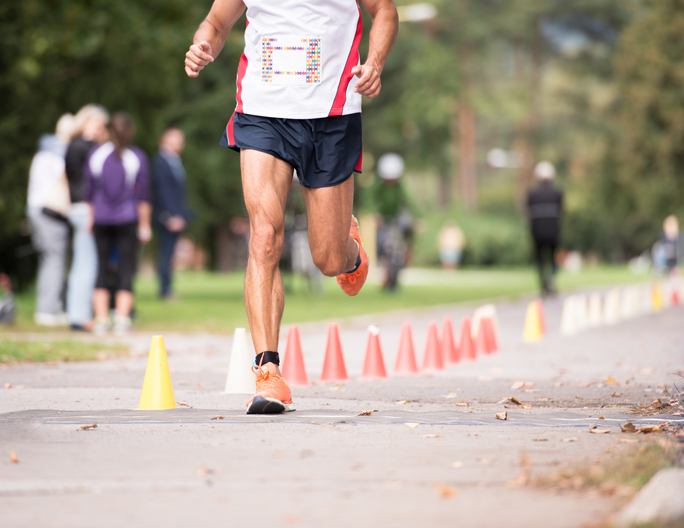 Part of your task as an injured runner is to it force the doctor to slow down enough so that you can extract the expertise you need from the doctor. Many runners find that more difficult than staying on pace for the last mile of their mile repeat session. If you leave the doctor’s office without understanding what you can do to maintain your fitness while you heal the running injury, you failed to extract the expertise from the doctor. If you leave the doctor’s office without understanding when you can safely resume running, you have failed to get the advice you need. If you leave the doctor’s office without understanding whether or not you have any hope of doing your race, or without any understanding of the risks of doing the race in spite of the injury, you failed to get the information you need from the doctor. It takes discipline to heal from a running injury. The first place to start with discipline is to make sure you understand what you want most. You can’t have a sense of entitlement and start believing that just because you signed up some race you can still finish even if you just ruptured your Achilles tendon and the race is a week away. That seems like a simple example and one that’s readily obvious to most people. The problem that comes in is when you have a more subtle injury, when you have a minor stress fracture, you have early onset of Achilles tendinitis, some little persistent ache or pain, some nagging injury that is actually interfering with your training, and you want to ignore it. If you ignore a persistently annoying injury it will probably get worse. If it does get worse, then you may not do as well in your race as you could have if you had actually taken care of the injury. In a sense the doctor has fixed your problem. No runner wants to be told to stop running. But in this relatively simple interaction we have just described, the doctor doesn’t understand your actual problem. This is a problem of communication. And you have to apply discipline to your communication with doctors. Discipline = plan + execution. You have to be clear about that. You have to be disciplined when you talk to the doctors. You also have to be disciplined in all aspects of your recovery. The most successful athletes are those who can consistently apply what they know will work. So you have to determine what will work. That’s where you get advice and expertise from the doctors. You take the doctor’s advice and you apply what will work. You have to have faith in your doctor. You have to have faith the doctor is going to help you head down the correct path. Then you have to be diligent in stretching, strengthening other areas, doing core work, doing other things you don’t normally do in training if they will substitute and help supplement your strength and recovery so you can actually get what you want most. Remember, you hired the doctor to help you. You’re not there to fit into one of the doctor’s boxes. So don’t feel relegated to the standard treatment evaluation process. 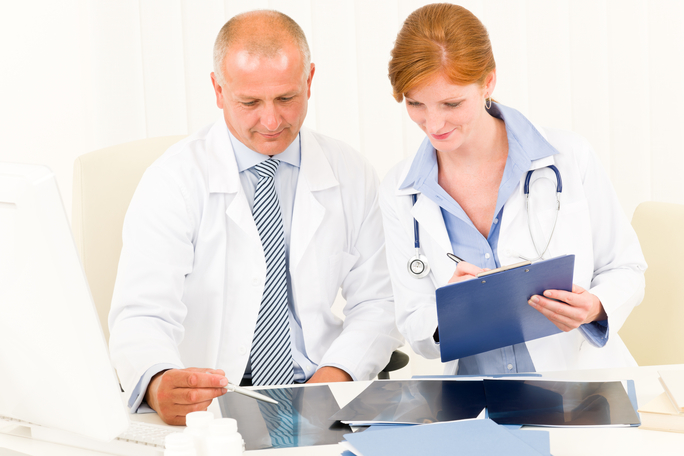 If you are going to get the best guidance from the doctor, don’t rely on the standard process. Every doctor has a medical history intake form. Usually begins with your name the date your date of birth and your chief complaint. If your chief complaint is “foot pain” that’s all the doctors going to focus on. 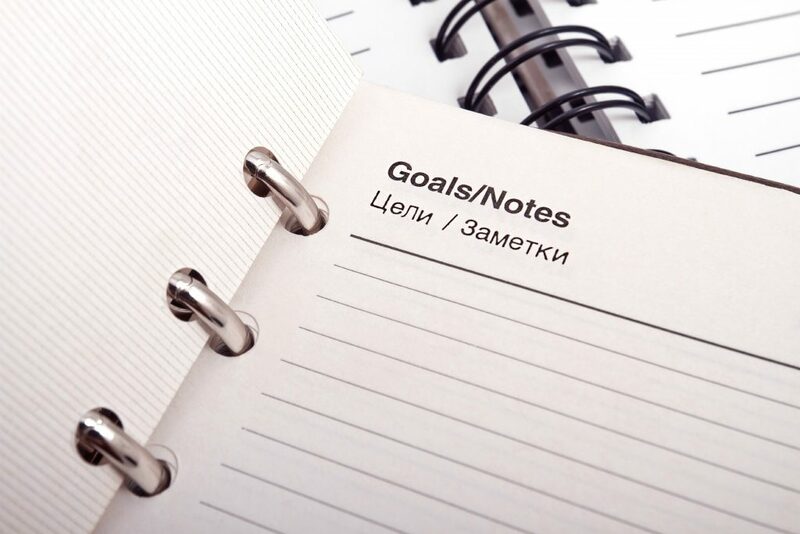 It is been said that if you don’t decide on your goals someone will decide a goal for you. This is true an employment opportunities and it’s true when you go to the doctor as well. Instead of writing down foot pain, be specific. Tell the doctor your foot hurts and is interfering with your training. Don’t let the doctor distract you. The best way to avoid distractions is to have a plan. Go to www.docontherunrun.com, go to the show notes page for this episode and download the free worksheet I’ve prepared for you. It’s called the Top 10 Questions a Runner Should Ask When Going to the Doctor. 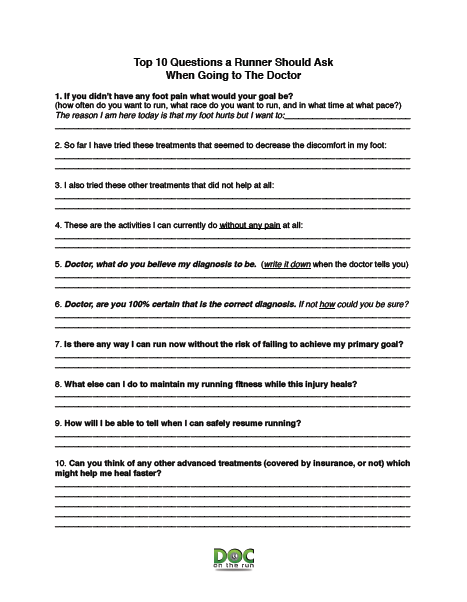 This is literally a one page sheet of 10 questions that you should ask yourself and ask your doctor when you go to the doctor’s office. If you don’t do this I promise you’ll miss something. Be armed with this single worksheet. Go with questions in hand and you will be better prepared to extract the expertise from the expert you hired.